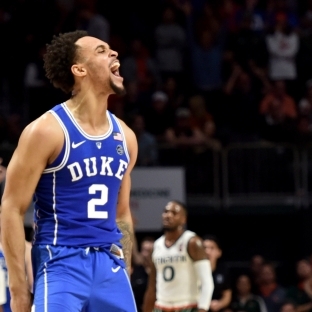 MIAMI — Duke freshman guard Gary Trent Jr. said he knew he was feeling it Monday night after he banked in a fall-away 3-pointer at the buzzer to end the half. Senior guard Grayson Allen had stolen the ball from Miami freshman guard Chris Lykes in the backcourt, and while on the ground, Allen passed it to Trent for the 3-pointer right before the buzzer. Trent’s 3-pointer at the end of the half was just the beginning. With eight minutes left in the game, No. 5 Duke found itself down 66-53 to No. 25 Miami. The Hurricanes forced Duke into some bad turnovers and also hit clutch shots. Then Trent happened. He hit two straight 3-pointers, sparking an 18-0 run that gave Duke a five-point lead, and eventually an 83-75 win. Trent scored a career-high 30 points (9-for-14). Coming from behind to win after being down double-digits isn’t new for the Blue Devils (16-2, 4-2 ACC). It had happened twice in the PK80 tournament in Portland — against Texas on Nov. 24 and Florida on Nov. 26. But it hadn’t happened in nearly two months. There was a time early in the season when Trent, who’s 6-6 and 209 pounds, was struggling from the floor and hadn’t quite found consistency. Trent went 0-for-6 from behind the 3-point line against Indiana on Nov. 29. Since then, he’s hit 31 of his last 60 3-point shots. He’s had his best games over the past few days. Against Wake Forest on Saturday, he was 6-for-7 from behind the 3-point line — even though he was sick and throwing up in a bucket by the bench. And Monday night against Miami, he was 6-for-9. Duke coach Mike Krzyzewski said Trent has really worked on his shot in the last week and a half. This Duke team works the ball inside first and then moves out, a pivot from previous Duke teams, which have historically been great 3-point shooting squads. The Blue Devils came into this season with few 3-point shooting threats. They had Allen and Trent. Aside from Trent’s hot shooting, freshman guard Trevon Duval, who at one point this season was shooting 17 percent from behind the 3-point line, has also been good recently. He hasn’t hesitated when he gets a wide-open look at a 3-pointer, and he’s knocked those shots down. He’s hit six of his last eight 3-pointers in the past three games. Freshman forward Wendell Carter Jr. is also taking 3s when he’s open and has made them. As a team, Duke has shot better than 50 percent from behind the 3-point line in the last two games and more than 40 percent over the last three games. Duke was 11-for-21 from behind the 3-point line on Monday night. There were times late in the game when Miami’s guards got past Duke’s guards in its zone. But on at least three occasions in the last seven minutes, Carter met them at the rim. Carter altered shots with his defense. He jumped straight up with his hands up and avoided fouling the drivers. On a couple of occasions, he sent shots back. And once grabbed the ball out of the air. Carter finished the game with four blocks to go with his 15 points and 14 rebounds. Bagley came out of the game with a shoulder injury on the second possession of the game when he was fighting for a rebound. He went back to the locker room briefly. After conducting tests, Bagley said doctors determined the injury was not serious. Bagley has been Duke’s best player this season. He leads the team in points (22 ppg) and rebounds (11.7 rpg). Bagley was 5-for-10 from the floor on Monday and struggled from the free-throw line, going 3-for-7. But he still finished with 13 points and 12 rebounds. It was his 15th double-double of the season, which broke a Duke freshman record set by Jabari Parker (2014) and Gene Banks (1978). Allen, the 6-5, 205-pound senior guard who scored 37 points against No. 2 Michigan State on Nov. 14, continues to struggle with his shooting. After going 0-for-5 against Wake Forest on Saturday, he finished 2-for-9 against Miami. Duke beat Miami without a big contribution from Allen on Monday night; it won’t be that way every game. Duke is at its best when Allen is on. His average has dipped to 15 points per game, and he is now shooting below 40 percent from behind the 3-point line.